The outstanding communication capabilities of virtual PBX phone system can be enjoyed without much capital investment. This is a great advantage for small businesses that want to boost their professional image.Innovative Features to help Small Businesses Sound BigThe PBX phone system is incorporated with innovative call handling features that are generally found in expensive telephone system owned by big business firms. These include auto attendant, find me follow me call forwarding, automatic call distribution, voice to email, fax to email, caller ID, call waiting, call conferencing, music on hold and much more. The auto attendant greets callers in a professional manner. For transferring calls to the appropriate departments or employees, the callers are presented with menu options such as dial-by-name, dial-by-extension and so on. This virtual receptionist skillfully handles multiple calls arriving simultaneously and performs instant call routing without transmitting line busy indications. In fact, the auto attendant performs all the functions of a live receptionist and more. So the business office with the virtual PBX system can cut the expenses required for employing call handling personnel, while at the same time projecting a 'big business' image. Eliminate Missed Calls with Virtual PBX by equipping your small business office with a PBX phone system, business calls can be accepted on alternate phone numbers including cell phones and residential landlines assigned as extensions through the convenient call forwarding option. Therefore business functions can be easily carried out even from overseas locations. Calls that are unanswered in the extensions are forwarded to the voicemail box, so that the callers can leave voice messages. This eliminates the possibilities of missing important calls. Voice and fax messages are also routed to your e-mail account and this enables you to provide instant responses to your clients while traveling. All this helps the small business convey big business front. No Expensive hardware hasslesTo gain from the diverse functionalities of the virtual PBX phone system, users are not required to invest in costly onsite equipment. 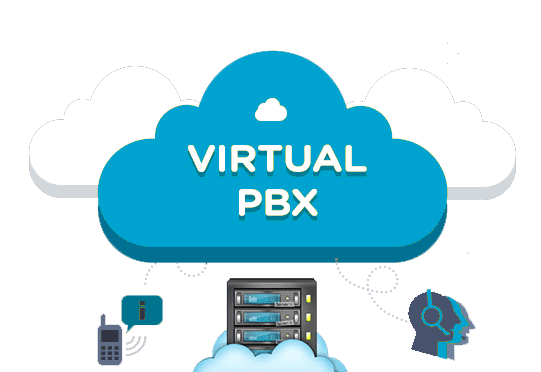 The service providers maintain the required hardware at their site and offered the virtual PBX system through a hosted server using broadband Internet or telephone networks at affordable monthly rents.